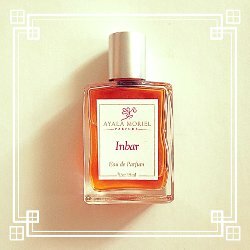 Indie natural perfumer Ayala Moriel has launched Inbar, a new oriental amber fragrance inspired by the Mediterranean garrigue. Additional notes include bergamot, jasmine, rose, clary sage, labdanum, vanilla, patchouli, sandalwood, benzoin and hyraceum. Ayala Moriel Inbar is available in 4 or 15 ml Eau de Parfum; samples are also available.